Sorry, to add too: Van Basten had had injury issues since his Ajax days, so it wasn't only his career-ending one that complicated matters. Maybe even at Euro 88, although a great player in great form, he wasn't free from all aspects of his injury problems (or the after-effects). Then there are players like Van Basten and Baggio who had ongoing injury issues, so did they never truly reach optimum potential because of those, or did they just reach it for short periods here and there? Pretty sure that had an effect for both, especially since it were bones, ligaments, cartilage, sinews. Also for Baggio you can see that his technique and trapping was not quite always at the same consistency while in other games it was 'flawless'. That's also true for someone like Robben with his muscle problems, since that bars him from training and refining things (he said also himself) as well as playing with a clear mind (although it can be argued he was/is nevertheless among the better North Europeans technically speaking, with some effective flicks too, in his execution at that level). Or Ronaldinho when he stopped bothering; his touch and control was not quite the same when he fell of his perch. I kind of feel like he lost something from his game (from his skillset or capabilities it's more difficult to say) going forwards as he got older, but then a defender doesn't have to be particularly effective in the opponents half and he maintained generally speaking good control over the ball and suchlike. Arguably his Leeds/England version is the closest he came to complete player (was gaining experience while still being the player that came through at West Ham who was often dribbling forwards and suchlike and playing under the 'it's ok to make a mistake trying to play football' instruction of Redknapp - of course it's true that West Ham were not a title challenger), but his Man Utd version for complete defender (and the Rolls Royce next to Vidic as bulldozer we could say?!). I guess his physique changed as he got older as initially he was more 'skinny' which might help dribbling runs if anything but being 'stronger' would help as a defender. Plus his attitude to the game adjusted a bit, while Ferguson (while noted correctly in general as an attacking manager) wanted him to focus more on defending and even curb his attacking instincts I believe a bit. He never turned into a Beckenbauer type defender/libero, although I'm not suggesting he had quite the capability, and I suppose there was merit to making sure he was first and foremost doing a good job defensively. At Man Utd though, even Pallister had probably made more forays forwards with the ball in earlier teams. But even for Franco Baresi, this transition happened to an extent probably - he wasn't quite as much a libero type in his later days or even at the height of his fame (and effectiveness as defender) perhaps, when compared to a few years before. But he did start playing in a flat back 4 rather than being a proper sweeper too. I think Ferdinand's game did change a bit more than Baresi's over time all in all, probably, although he'd never been a true libero in a back 4 IIRC and neither been made sweeper in a back 5 for England or anything like that (I would think that had seemed a reasonably likely occurance, at least as an experiment, given England did play with 3 CBs when he started to break through). I remember in early 00s FIFA video games he already seemed an impossible defender to face at times! And even though I agree he was relatively (and deceptively) quick, he even seemed quicker on that than in real life IIRC! It was quite hard to try to play the game against a team including him. It was like "damn, Ferdinand has got back and tackled me again" lol. True, Ferdinand was never a true Libero in the form of a Beckenbauer. He's more of what the English pundits would call 'cultured' or 'ball-playing defender.' You see it now with someone like VVD and Vertonghen. I remember this is a quite good discussion about him by Manchester United fans a year ago - I read the first page and last two pages in detail. It is worth a read. What is maybe underrated is what a good ball player he was (with pace in his actions!) and I'd think Nesta (who was arguably the best defender of the first half of the 00s) was not quite at that level of construction. It's that ball playing skill that made him twice the world's most expensive defender. He was also a particularly clean defender, certainly cleaner than the nasty Nesta, making him very useful for European games. In the 'The Mixer' book I read the claim by the end of his career his ball playing wasn't special for a defender any more (i.e. others got better at it), and the book illustrated it with a long ball example (+ pundits reaction), but was thinking indeed that Ferdinand altered his style and also that Manchester United wasn't quite so dominant in spreading play/wing play any more so that a defender can spread the ball around. I'd say the team wasn't so great for that any more either. My impression was/is he's particularly liked in Holland (compared to Terry, Carragher although I saw VI opted for Terry as an EPL icon and not included Ferdinand), but if I type in google 'top 50 english players' then the most popular hit, by 'goal.com', included Ferdinand among the top 50. The 2nd hit, by The Independent, ranked him 9th among all EPL players and above Terry (I also saw their 'greatest central midfielders' list of this week, and searched for a defenders version). But yes, someone like Jimmy Greaves (with a less short-term sight) rated him not particularly high. Best players of 2008, #18 - "Former West Ham stopper, Tony Gale recently described Rio Ferdinand as the Rolls Royce of defenders, a description most fitting of a man who, despite his talent, has always been somewhat sold short throughout his career. He is the world's most expensive defender, yet often finds himself being considered second best: whether to John Terry at international level, or now Nemanja Vidic alongside him for Manchester United. In truth, 2008 was a year in which he proved he is superior to them both and has that extra dimension to his game, with not just the physical presence and athleticism of a top class defender, but the anticipation, awareness and leadership required in any backline if it is to be as successful as United's was last year - the best in Europe, no less. And speaking of Europe, it was Rio who captained the Red Devils in the Champions League final and lifted the trophy in Moscow after a hard fought victory over Chelsea on penalties." I'd say his defending clearly peaked when Vidic arrived, and you can also see that in the 'Vidic years' he has only two errors leading to goal (in the league) while before that rate was a lot higher (and with 'a lot' I mean >500%). He got positionally better and sorted out weaknesses in the air and at set pieces, his concentration got better. Some argue Vidic was the more indispensable, universal and irreplaceable piece in the backline (resulting in that Vidic was once ManUnited player of the year, twice league player of the year while Ferdinand did not receive that type of 'player of the year' honors) but Ferdinand should rank higher as a footballer and was class in how he solved defensive situations (and was seemingly also more class as a person as for example Terry and Carragher, lol). I wouldn't exactly say he had the strength of a stopper to deal with a Drogba or Ibra, but was of course not an old style libero either (Blanc, Scirea etc.). I'm pretty sure everybody says that every 20-25 years in a sport. I'm sure in another 50-75 years, someone will rival him. It might not even take that long. 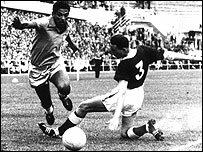 “When garrincha stood and faced you his legs went one way and his body the other, there's no doubt about it, he could have been declared a cripple. But my God could he play," said Hopkins, who also won the League and FA Cup double with Tottenham in 1961. If nothing else, Wright was much faster than Ian, and at the very least just as good a finisher, although Rush was probably the better header. Wright was very prolific in Europe as well. He only had two campaigns in it though being the 93-94 and 94-95 Cup Winners Cup, which he helped the team reach the finals in both cases, the highlights being beating the Italian clubs Sampdoria and Parma. He was top scorer in 94 and one goal off the top in 95. Ian Wright was actually my first Arsenal hero, but he was soon replaced in my heart by Tony Adams. This is interesting. I saw some Pele games in the early 60s for Santos and he was crack. He had it all. Even that 62 game in the World Cup before he got injured was a huge presence. Pele's passing and playmaking abilities in the santos games I have seen from him are top notch. We can debate the amount of legitimate goals he has, but he is still an elite goal scorer, with both feet, and a good header of the ball. HOWEVER, in terms of dribbling, you're right I think. Messi has scored so many fu&*in times where he dribbles 3+ players. It's unbelievable. Even the amount of times Messi has dribbled 3+ more defenders and not scored is more than I can remember. I have never heard Pele or anyone else make a claim that Pele has scored so many dribbling goals. As a pure dribbler, I would also put Garrincha and Maradona in front. As well as Messi. So you may be right. It is possible that no one player hasn't perfected so many attributes to his game. Very hard for Wright to make an impact for the NT considering he only started 17 games. Shearer was by far the better striker, so of course he had the starting spot. Wright also never played in the European Cup, so it's impossible for him to make an impression there. In the European campaigns that he did participate in, he won top-scorer in one and was one goal off the top in the other. Rush played no part in the 1981 victory, but he was very good in both 84 and 85. Wright was banging in them goals before Bergkamp arrived in England. What makes you think Rush was the only one capable of leading the line for Liverpool? People thought the same about Keegan until Dalglish came along. Rush at his peak is still behind Dixie Dean as well. If it's one year peak we're talking about then his record in front of goal was no better than Andy Cole or Alan Shearer. If we're talking about peak 3-5 years, then Rush can't can't even come close to Shearer's 3 consecutive 30+ league goals season. In fact, Harry Kane's record is already a match for Rush. Neither Shearer nor Kane played for as good a team as 1980s Liverpool. I don't think it's clear cut that Rush was 2nd best behind Sanchez either. It wasn't obvious he was better than Careca or van Basten, for example. Basten was already dominating the Dutch league by the mid 80s. Within the same league, I'm not so sure that Rush was superior to Lineker. Yeah, to be honest quite a few of those goals are from when he was relatively old, so it shows he could still be a very good finisher (I think he was maybe never the most reliable from a technical point of view in that way, but what he was was capable of scoring impressively and/or efficiently on both sides). The Liverpool shirt with white stripes on the main part of the shirt was early 90s for example. But yes, like Papin actually, he was at times ridiculed a bit harshly in his later career I think. Maybe it's inevitable that when a famous player loses form or capabilities fans will be saying they are 'rubbish' etc. It's hard to be sure, but I'm actually thinking that he might even have been quicker than Wright if anything for most of the time when he played at Liverpool the first time (early to mid 80s). He was extremely quick at that time anyway, and renowned for it. The Dalglish-Rush partnership was a famous and very productive one. The most famous Dalglish to Rush goal is the one on the video vs Watford (in white) where Dalglish turns with the ball on half-way and plays Rush in behind the defence, and Rush scores left-footed. His Juventus spell doesn't help his overall legacy I suppose, but it's evident from some things Vegan posted (predictions about top scorers, stars of the season etc, plus earlier Guerin Sportivo world XI voting from his Liverpool days) that a lot of Italians expected he would do well there, and rated him highly among the strikers of the world. Perhaps Van Basten would be seen as having more potential though, by the mid 80s, if people saw enough of him. Yeah, so he only scored the 'Maradona goal' in training! Peterhrt posted his top 10 players in the heroes thread of course too (including Baresi in 10th, but MvB and Rijkaard higher up). I don't think I'd have guessed Wright (based on West Ham period - but of course he can be influenced by the Arsenal time too) or Kluivert (given he must've played against a lot of top PL players by then). His voice got a fair bit deeper as he got older I think (maybe the way he talks as much as physical reasons)!